Kids Are Natural Scientists—Let Them Take the Lead! 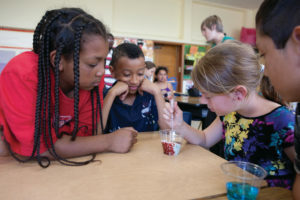 Home Collaborative Circle Blog Kids Are Natural Scientists—Let Them Take the Lead! Science is based on curiosity and finding evidence. Giving kids opportunities to roll up their sleeves and understand the world around them by looking for evidence is a great way to be a “guide on the side” rather than a formal teacher or science expert. By letting the children lead, watching what they do, and asking questions, you empower them to follow their natural curiosity. 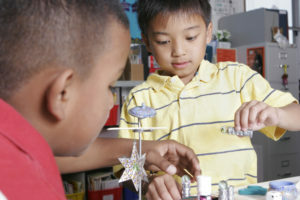 By encouraging them to help one other and share ideas and materials, you help them build important social skills. Kids love to play and explore. It is through this behavior that they process, learn, and become critical thinkers and problem solvers, and we must take care not to stand in their way. When practicing science, they are bound to come up with questions; when we answer those questions for them, we take away from their learning experience. Take a breath and wait for them to discover an answer. They might even struggle. Or better yet, instead of an answer, they may come up with more questions that allow them to go deeper. Maybe they will even make a mistake or two! Isn’t that what science is all about? Making mistakes? Trying again? I have learned the most and made some of my most successful decisions as a result of the mistakes I have made. Would we have come so far in finding a cure for cancer without scientists making mistakes and trying again? The next time you have the opportunity to do hands-on science with your students, remember the importance of letting them do the work while you act as a “guide on the side” instead of a “sage on the stage.” Let them work together to do the heavy lifting, and when they make mistakes, let them try again. That is how we learn! Watch this video to learn more about the value of kids working together, and ways you can support them as they do so.